Try to learn something about everything and everything about something - Thomas Huxley.... It is a blog concerning the current affairs and events and includes topics of all kinds from business, education, entertainment, food, heritage, lifestyle, politics, religion, science, technology and many more. In India, every person has had a glorious past. Glorious Vedic, Buddhist, Dravida and probably non-patriarchal past. I will restrict myself to Buddhist past of Kerala. Just other day, I came across a comment that Buddhists were all holocausted in Kerala. Since this part of the history is a constructed from archeological evidences and not recorded in the history, in print or in visual media, I think I can question this without being labelled as a holocaust denier. I do have serious problems with glorious Buddhist past theory. Whenever, some of the propagandists from Kerala portray Buddhism as something secular, egalitarian and noble, I laugh. Just show that to me in the past Sri Lankan society. It seems Malayalees became agrarian society around 7th century CE. Well, Kerala society existed even before that. So what could have been the main communities of Proto-Malayalees. I can think of only tribals and fishermen. Tribals, could be spirit worshipers or shamans. What about fishermen, probably idol worshipers, worshiping the goddess of the sea and probably Tantriks. So what happens when Buddhist preachers visit such a society? For that, we have to understand the spread of Buddhism in pure Shamanist Tibetan society. A member at Quetzalcoatl Anthropology forum mentioned that Tibetans got Shamanic religion from Burushos which was later supplanted by Buddhists from South Asia (Or is it from China, I forgot). Initially, Shaman priests were barred from practicing the religion. However, Buddhism being more egalitarian when it comes to education these Shamanist priests could merge their religion and could give rise to a synthesis of Buddhism and Shamanism, claiming back their priestly position. So there is no relation with Buddhism and Shamanism. Among fishermen and tribals who could be the most advanced community? I think it should be fishermen. Just as in Tibet, the Tantrik fishermen also got educated because of Buddhism. However, unlike Tibet their Tantrik religion remained dominant and Buddha was lost. Again there is no relationship between Buddhism and Tantra. In South India, many rulers were Jains until probably 12-13th century. The most of the religious wars were between Jains and Saivites(in Tamil Nadu and Karnataka) and between Jains and Buddhists(in Andhra Pradesh). At least, these were recorded in the history. I don't have any idea if any Andhra Pradesh Brahmins are known as Tantris. So I am not sure what happened to Buddhists of Andhra Pradesh. Since Jains were mostly rulers and elite in all of the South Indian society their numbers remained small or they were absorbed into Vishnuism of later centuries(as both had common enemies in Saivas). It should be noted here that Buddhists were never rulers of South Indian society. I don't think Tantriks of Kerala knew the story of Pushyamitra Shunga of 2nd century BCE. Also, since I don't believe Buddhists were ever rulers of Kerala society those Tantriks had any identity. The rulers could be mostly from the Shamanic tribals. As Vaidiks migrated to Kerala society something happened and all the Tantriks got merged with them. Of course, just like those Shamanist priests of Tibet, they continued to control the temples of Kerala but changing its character. I believe there could be a Jain holocaust in South India(which again I don't believe) but never Buddhist holocaust. They(Tamil Brahmins) held themselves higher than Malabar Brahmins and Namboothiris, who they say sprang from fisherman elevated to Brahminical dignity by Parusuraman. The Buddha idols of Mavelikara and Karumadi in south Kerala are now well known all over the world. Today we see plenty of relics and ravages related to Buddhism and the Sramana tradition in Kerala scattered all over the state. Architectural and sculptural reminiscences are numerous apart from the vital linguistic and cultural imprints like the abundance of Pali (the ancient Buddhist Bahujan language) words in the present south Indian regional languages. The state is also known for the educational and health care achievements apart from its universal literacy. All these human development indicators are not just the product of 20th century evangelical Christian missionary activities and state welfare schemes but the lasting legacy of Buddhism, the democratic, egalitarian and inclusive way of living that shaped the cultural contours of Kerala from B C 3rd century to A D 13th century. Kerala is also known for its progressive left and democratic politics. This grass root level democracy and collective struggles of subaltern people are also a reminiscence of Buddhism that was the first missionary yet peaceful religion that welcomed women and outcastes to the mainstream community. The people or Bahujans who were defiant to Hindu Brahmanism after the destruction of Buddhism by Brahmanism were condemned as untouchable Chandals as outside the Brahmanic Hindu Chatur Varnayam after the devastation of Sramana tradition in Kerala. These Chandals or untouchable Buhujan masses were and still are the agents of Kerala social revolution or renaissance under the aegis of various radical social rebellions like the Narayana Guru movement, Ayyankali movement, Sahodara movement and various other progressive left and democratic processes in Kerala..
Kerala is also known for its progressive left and democratic politics. This grass root level democracy and collective struggles of subaltern people are also a reminiscence of Buddhism that was the first missionary yet peaceful religion that welcomed women and outcastes to the mainstream community. The people or Bahujans who were defiant to Hindu Brahmanism after the destruction of Buddhism by Brahmanism were condemned as untouchable Chandals as outside the Brahmanic Hindu Chatur Varnayam after the devastation of Sramana tradition in Kerala. These Chandals or untouchable Buhujan masses were and still are the agents of Kerala social revolution or renaissance under the aegis of various radical social rebellions like the Narayana Guru movement, Ayyankali movement, Sahodara movement and various other progressive left and democratic processes in Kerala. According to researchers, historians and thinkers like P C Alexander, P K Gopalakrishnan, Pavanan, Puthussery Ramachandran, Aju Narayanan etc. Buddhism was introduced in Kerala in the B C third century itself by the missionaries of emperor Asoka on their way down south to Sri Lanka which still is a Buddhist country. Jainism and Ajivaka philosophy also co-existed with Buddhism creating the great Sramana civilization of the South that has given birth to cultural classics like The Thirukural, Silapatikaram, Manimekhala and the whole canon of Sangham writing. 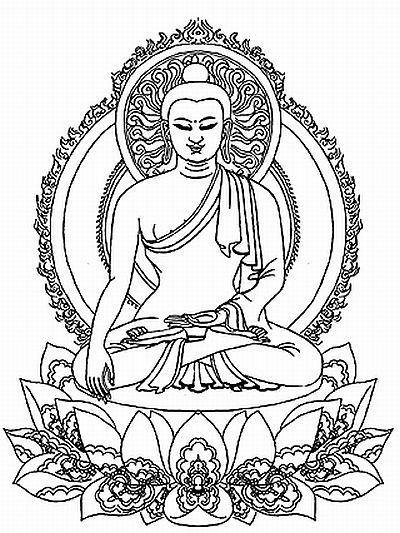 The Buddhist, Jain and Ajivaka seers introduced the Brahmi script and the art of writing in South India. All the early inscriptions now available are written in Brahmi script in Tamil language. The ancient Tamilakam or Tamil country was a treasure house of Sramana heritage. Almost all the current Savarna Hindu temples in Kerala are modified Buddhist or Jain temples by coveted Brahmanism and its Padaja (Sudra or subservient Varna) forces. The brutal persecution of Buddhist monks/nuns and conversion of temples happened in eighth and ninth centuries under the leadership of Sankara the furious advocate of Brahmanical propaganda and violence. He argued with other religious scholars, defeated them verbally and annihilated them and their religion forever. His brutal followers and henchmen like Vramila Bhatta converted the seat of the defeated to that of Hindu Brahmanical temples with extended support from ruling classes. He is also called Prachanna (pseudo) Buddha as he modified and disguised Buddha’s Sunyavada (rational theory) into the empire of the. Brahmanic self, the Advaita ‘theory’ that reiterated and enforced caste division and hierarchy with a peripheral and cunning shroud of unity that cheated the masses. Thirumulla Varam, Thottappally, Podiyil Mala, Sabarimala, Kodungallur, Thrissur, Kottakkal, Madappally and Bekal were world renowned Buddhist shrines of worship, learning, health care and nature conservation. In places like Mathilakam and Kiliroor there were even Buddhist and Jian universities and Research centres in Kerala in the early centuries of the first millennium that attracted intellectuals and students from all over the world. Pally is still the most popular affix used along with place, plot and family names in Kerala, Tamil Nadu, Karnataka and Andhra. The Pali word Pally means a non Hindu/ Brahmanic place of worship. In the ancient times it denoted a Jain or Buddhist shrine. Buddhism guided culture and society in the south for more than a millennium. It was erased from Kerala through the barbaric and coveted Brahmanic invasion that happened from the fifth to eighth centuries under cruel and reckless royal patronage and usurpation with power. Images and records of Buddhist persecution by the Brahmanic barbarians are still available in Kerala in the form of stone carved images, local subaltern orature and secret lore (Valath). The Hindu Brahmanic colonists burned the Pali canon and the sacred texts and knowledge systems of Buddhism in Kerala. These nomadic Aryans from the Vedic and Sanskritic clans of West and Central Asia introduced Sanskrit and Hindu religion in the South Indian Kingdoms. They found leverage in royal patronage through cunning usurpation and cheat. The legend of Onam and Maha Bali still articulates the historic deceit of Buddhist Bahujan culture by the Brahman dwarfs. Poets like Sahodaran Ayyappan has extensively written about the internal imperialism of Hindu Brahmanism in Kerala. The Brahmans created the notorious sexual colonies among the Sudra women and used their male counterparts as foot soldiers who ensured the caste and Varna system, the practice of untoucahbility and pollution. The Sudras in return were given land and titles (as Nayar, Panikar, Thampy, Unni, Kaimal, Kurup, Menon etc. )with which they suppressed the local defiant untoucahable people having Buddhist lineage with bloody hands and weapons. These foot soldiers and menial hands of Brahmansim were absorbed to the Chatur Varnyam (fourfold Varna stratification of Brahmanical imagiNation comprising of Brahman, Kshatriya, Vaisya and Sudra) as the fourth and last Varna, the Sudra. The vast majority of people, the Dalit Bahujans were outside the cultural geography of Brahmanism as Chandals and Mlechas, as they are the former Buddhist and Jain population. 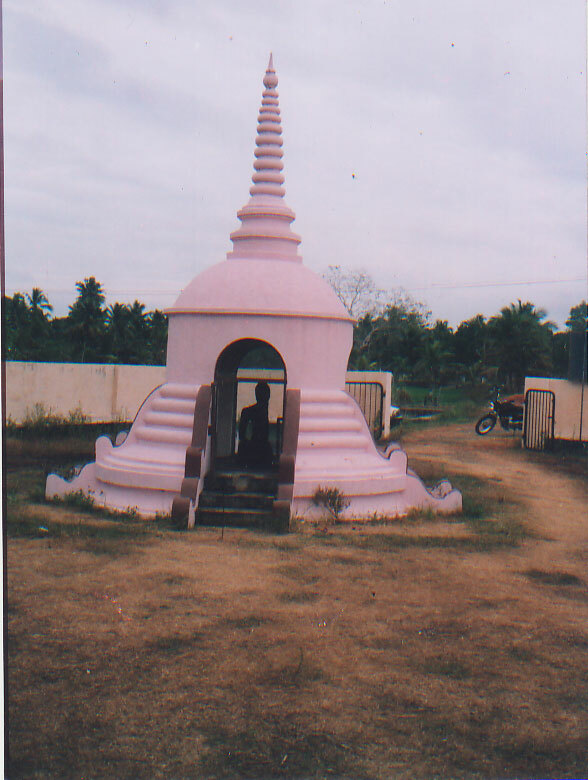 Perinjanam Pallyil Bhagavati temple north of Kodungallur. The first installation by Pallyvanar in early 16th century. Goddess became prominent here as well. The Nayar dominance in Kerala history began in the middle ages with large scale Brahman settlements and militarization and still holds sway though they also want to be declared as a backward community now, as they still relish absolute power! According to state commission reports this power elites and historically advantageous group having less than 15 percent of Kerala’s population enjoy more than 32 percent share in government jobs. In higher education and universities it is more than 48 and in private owned print media and visual media it is almost 90 percent. Imagine the extent of Savarna Nayar hegemony in Kerala even today! These henchmen of Brahmanism who cheated and killed their Buddhist, Ajivaka and Jain brethren to enforce Brahmanic caste and did the work of pimps by fetching their own women for the Brahmanic high priests with all the shameless pride of getting an elite alliance; are now hailed as the Samurais of Kerala by some fascist spokesmen of elitism who thrive in popular cinema and culture. This historical mediating middllemen are still the advocates of Gita classes, Veda and Vedantic obscurantism in Kerala and outside! They are the orchestrators of Hindu hegemonic discourses and the power heads of the Parivar forces all over the country allying with the Neo Kshatriya aspirants. They are also Hinduizing the Bahujan masses who are attracted to power and chauvinist social status! They need the numbers of Hinduized Bahujans for their pseudo majoritarian and fascist politics. It is an absurdity of history that some of them even today boast about their Brahmanical wedlock which was stopped just a few decades ago! This Brahman – Sudra alliance or infamous Sambandham gave birth to the Manipravalam literature, the new Malayam-Tamil and later Malayalam and the Savarna elite culture of Kerala in the dark and dubious middle ages that Sanskritized and Hinduized Kerala elites and a lot of people. Even Syrian Christians boast about their Brahmanical connections more than 2000 (?!) years after conversion! Actually there were no Brahmins in the south in the A D first century! Then how could St. Thomas convert those absent Brahmans to Christianity? The coveted Brahmans came to Kerala only in the 4th or 5th century or later. The power of Brahmanism and Hindu hegemonic discourse is that much tangible and an everyday reality in Kerala and India. This hidden Savarna elitism is the real culprit behind all the fascist pogroms and genocides in post Independent India. All the minority religions in Inida and Kerala like Jews, Muslisms and Christians still use the Pali word Pally to refer to their place of worship along with Jains and Buddhists in the south. Buddhism is making a second coming as an ethical philosophy and eco-spiritual alternative way of life all over the world and in India and Kerala in particular. The historic affiliation to Buddhism in the philosophy and praxis of Narayana Guru the seer of Kerala modernity, his disciples and intellectuals like C V Kunhiraman, Asan, Sahodaran Ayyappan and now the new Ambedkarite Dalit movement in Kerala are significant. Dr Babasaheb Ambedkar’s illuminating subaltern hermeneutics of Buddhism in his masterpiece Bddha and his Dharma are also instrumental in the second rebellion of Buddhism against caste Brahmanism and social exclusion. Plenty of radical scholars and organic intellectuals in India and Kerala are now working on Buddhism like Gail Omvedt herself. It could be well assumed that Buddhism is emerging as the cultural and ethical alternative of the present and future all over the world and particularly in Kerala. The Bahujans in Kerala who lost their true Sramana legacy in the onslaught of Hindu Brahmanic internal imperialism are now recovering from the calamity of Brahmanism and its burden and looking forward to alternative paradigms and new ways of living. Alexander, P C. Buddhism in Kerala. Gopalakrishnan, P K. Keralthinte Samskarika Charithram. Tvm: Kerala Bhasha Institute, 2001. Omvedt, Gail. Buddhism in India: Challenging Brahmanism and Caste New Delhi: Sage, 2007. Pavanan. Baudhaswadheenam Keralathil. Tvm: Kerala Bhasha Institute, 2008. Ambedkar, B R. Buddha and his Dhamma. Bombay: Govt. of Maharashtra, 1980. Valath, V V K. Keralathile Sthala Charithrangal: Ernakulam Jilla. Thrissur: Kerala Sahitya Academy, 2001. —, Thrissur Jilla,Thrissur: Kerala Sahitya Academy, 2001. —, Thiruvananthapuram Jilla, Thrissur: Kerala Sahitya Academy, 2001. Generation of spoiled idiots (அ) வாழ்க பாரதம், வளர்க தமிழ்நாடு in கொழந்த's blog Wednesday, September 21, 2016. காவிரி நீரை பங்கிடுவதில் 1800 ஆண்டுகளிலே தொடங்கி சிக்கல் இருந்துள்ளது. பலகட்ட பேச்சுவார்த்தையைத் தொடர்ந்து 1892 ஆம் ஆண்டு அன்றைய சென்னை மாகாணத்திற்கும் (மெட்ராஸ் புரோவின்ஸ்), மைசூர் மாகாணத்திற்கும் (மைசூர் புரோவின்ஸ்) நதிநீர்ப் பங்கீடு ஒப்பந்தம் கையெழுத்தானது. தொடர்ந்து 1924 ஆம் ஆண்டு மீண்டும் ஒரு ஒப்பந்தம் கையெழுத்தானது. மொழிவாரி மாநிலங்களாக தமிழ்நாடும், கர்நாடகாவும் உருவானது. இதன் பின்னர் காவிரி நதிநீர் பங்கீட்டுப் பிரச்னை தீவிரமடைந்தது. 1976ம் ஆண்டு ஆகஸ்ட் மாதத்தில் இரு மாநில அரசுகளும் ஒரு புதிய ஒப்பந்தத்தை ஏற்படுத்தின. எனினும் பிரச்னைக்கு தீர்வு எட்டப்படாத நிலையில் 1983ல் நீதிமன்றத்தில் வழக்கு தொடரப்பட்டது. தமிழகத்தின் நீண்ட நாள் கோரிக்கையை ஏற்று 1990ம் ஆண்டு காவிரி நடுவர் மன்றத்தை அமைக்க உச்சநீதிமன்றம் உத்தரவிட்டது. காவிரிப் பிரச்னையை விசாரித்த நடுவர் மன்றம், 1991ம் ஆண்டு ஜூன் 25ம் தேதி இடைக்காலத் தீர்ப்பு ஒன்றை வெளியிட்டது. அதன்படி, கர்நாடக மாநிலம் ஆண்டுக்கு 205 டி.எம்.சி தண்ணீர் வழங்க வேண்டும் என்றும், கர்நாடகா தனது பாசனப் பரப்பை 11 புள்ளி 2 லட்சம் ஏக்கருக்கு மேல் விரிவுபடுத்தக் கூடாது என்றும் கூறப்பட்டது. மழை பொய்த்து போகும் காலங்களில் எல்லாம், தண்ணீரைத் திறந்து விட வேண்டும் என்று தமிழக அரசு வலியுறுத்துவதும், தங்களது தேவையை பூர்த்தி செய்யவே போதுமான தண்ணீர் இல்லை என்று கூறி கர்நாடகா கைவிரிப்பதும் தொடர்கதையானது. இந்நிலையில் காவிரி நதிநீர் பங்கீடு தொடர்பாக, கர்நாடகா மற்றும் தமிழகத்தில் போராட்டங்களும், வன்முறைகளும் நடந்து வருகின்றன. தற்போது கர்நாடகாவில் நடந்து வரும் பந்த் மற்றும் மறியல் போராட்டங்கள் வன்முறையாளர்கள் கைக்கு போய்விட்டது. வன்முறை கட்டவிழ்த்து விடப்பட்டது. பெங்களூர் வாழ் தமிழர்கள் மிகுந்த அவதிக்குள்ளானார்கள். கடைகள், சொகுசு பேரூந்துகள் அடித்து நொறுக்கப்பட்டும் தீயிட்டும் கொளுத்தப்பட்டன. சட்டம் ஒழுங்குப பிரச்சினை பற்றி பேசப்பட்டது. இந்நிலையில் கொழந்தைஸ் பிளாக்கில் வெளியான Generation of spoiled idiots (அ) வாழ்க பாரதம், வளர்க தமிழ்நாடு கொழந்த's blog என்ற கட்டுரை நதிநீர் பற்றி வலுவான விழிப்புணர்வினை ஏற்படுத்தும் என்பது திண்ணம். படித்து உங்கள் கருத்துக்களை பகிரலாமே! எதற்கெடுத்தாலும் உணர்ச்சிவசப்படுவதே தமிழர் மரபு. ஒரு வீடியோவையே இதற்காக வேலைமெனக்கெட்டு அப்லோட் செய்துள்ளேன். இந்த காவிரி பிரச்சனையில்(கிட்டத்தட்ட எல்லா பிரச்சனைகளுக்கும்) பெருவாரியாக எழுப்பப்படும் கோஷங்களில் ஒன்று - தமிழர்கள் வஞ்சிக்கப்படுகிறார்கள். தமிழ்நாடு என்றொரு மாநிலமே இல்லை; அட...இதை சௌராஷ்டிரநாடு என்று வைத்துக்கொள்வோம். இப்பொழுது இருக்கும் பிரச்சனைகள் அப்பொழுதும் இல்லாமலா போய்விடும். இலங்கை நண்பர் ஒருவர்கூட - எங்கு போனாலும் தமிழர்கள் அடிவாங்கிக்கொண்டே இருக்க வேண்டியதுதானா - என்று ஸ்டேடஸ் போட்டிருந்தார். நண்பரே....இலங்கை தமிழர்கள் என்றில்லாமல், இலங்கை தெலுங்கர்களாக இருந்தாலும் இதேதான் நடந்திருக்கும். அடுத்தவனை நாசமாக்கப்பார்ப்பதெல்லாம் human traits. உலகம் முழுக்க உள்ளதுதானே. எப்படி, மைனா - invasive speciesஸோ, அதுபோல பல விஷயங்கள் defaultடாக நமது ஜீனில் உள்ளது. சரி, அவ்வளவு உத்தமர்களாக இருந்தால் - ஏன் ஒரு தரப்பு "தமிழன்" மட்டும் பீ அள்ளிக்கொண்டிருக்க வேண்டும் ? தமிழர்/திராவிடம் பேசும் எல்லாரிடமும் இந்தக்கேள்வியை கேட்டிருக்கிறேன். இதுவரை ஒருவர்கூட உருப்படியான மறுமொழி சொன்னதில்லை. காவேரி - பூகோளரீதியாக நாம் இருக்கும் இடம், கர்னாடகா ethicalலாக நடந்துகொள்ள வேண்டும் என்பதையெல்லாம் விடுங்கள். நாம் நமது natural resourcesசை என்ன செய்து கொண்டிருக்கிறோம் ? இந்தப் பதிவின் நோக்கம் இதுமட்டுமே. நிலத்தடி நீர்வளம் - மலைகள் - ஆறுகள்/ஆற்றுப்படுக்கை, ஆற்று மண்.....ஒன்றைக்கூட விட்டுவைக்கவில்லை. அவ்வளவு தூரம் கெடுத்துவைத்திருக்கிறோம். இந்தரீதியில் போய்கொண்டிருந்தால் இன்னும் இருபது - முப்பதாண்டுகளில் பல்லி மூத்திரம் அளவிற்குதான் காவேரி ஓடிக்கொண்டிருக்கும். ஜல்லிக்கட்டு - இயற்கையின் பெருமையை போற்றுகிறது; தமிழர்களுக்கும் இயற்கைக்கும் உள்ள உறவை எடுத்துக்காட்டுகிறது என்றெல்லாம் வாய்சவடால் விடுகிறோமே....நாளுக்குநாள் இயற்கை வளங்கள் எல்லாம் குறைந்துகொண்டே போகிறதே. அதுபற்றி கொஞ்சமாவது உறுத்தல் இருக்கிறதா ? நிஜமாகவே இயற்கையின்மீது பிடிப்பிருந்தால் - இதையல்லவா முதலில் காப்பாற்ற வேண்டும். "Natural Resources Management"ல் தமிழர்கள் அறிவு. சூன்யம். பூஜ்யம். சைபர். எங்கு வேண்டுமென்றாலும் வந்து சொல்வேன். உடனே, "2000 ஆண்டுகளுக்கு முன்பே...." என்று ஆரம்பிக்க வேண்டாம் ஐயா. 2000 ஆண்டுளுக்கு முன்பிருந்த மக்கள்தொகை வேறு; வாழ்க்கைமுறை வேறு; இத்தனை தொழிற்சாலைகள் இல்லை; இத்தனை கட்டிடங்கள் இல்லை; இத்தனை குழப்பங்கள் இல்லை; வாழ்க்கை இத்தனை சிக்கல் நிறைந்ததாக இல்லை; அப்போதிருந்த மலைகள் இல்லை; ஆறுகள் இல்லை. எல்லா மாறிவிட்டது. நிகழ்காலத்திற்கு வாருங்கள் ஐயா. தொட்டதற்கெல்லாம் "2000 ஆண்டுகுளுக்கு முன்பே தமிழன்..". Natural Resources Management - எந்த கட்சி ஆட்சிக்கு வந்தாலும் இதில் மட்டும் முன்னேற்றமேயில்லை. நண்பர் ஒருவர் Facebookல் போட்டிருந்தார் "சிவகாசி திருப்பூர் போன்ற நகரங்களில் கூட முன்பிருந்தது போன்ற தண்ணீர் பஞ்சம் இல்லையென்றால் திமுகாவின்" என்றாரம்பித்து ஒரு போஸ்ட் போட்டிருந்தார். ஒழுங்கான திட்டமிடல் இல்லாமல் இந்தப் பகுதியில் தண்ணீர் எடுத்ததன் விளவை கீழே - over exploited mapல் பார்த்துக்கொள்ளுங்கள். Of course, தண்ணீர் ஒவ்வொருவருக்குமான உரிமை. அதை கொடுத்தேயாக வேண்டும். ஆனால், அந்தப் பக்கம் க்வாரி அனுமதி வழங்குவதில் ஆரம்பித்து - நீர்நிலைகளை முறையாக தூர்வாராமலிருந்தது - முறையற்ற போர்வேல்கள் - ஆற்றுபடுகைகளில் ஆக்கிரமிப்புகள் - குளம் குட்டை ஆக்கிரமிப்புகள் - மணல் மாஃபியா - திமுக/அதிமுக அரசுகள் பற்றி லிஸ்ட் போட்டுக்கொண்டே போகலாம்...விளைவு ? கீழே கொடுக்கப்பட்டிருக்கும் ரிபோர்ட்கள் அனைத்தையும் படியுங்கள். கையாலாகாத, ஊழல் நிறைந்த அரசும் + அதன் கட்டமைப்பும் பெருமளவில் இதற்கு காரணம் என்ற உண்மை, கொஞ்சமாவது உறைக்காவிட்டால்....கஷ்டம். போன வாரம் தமிழ்நாட்டில் - காவேரி விவசாயிகளுக்காக முழுகடையடைப்பு நடத்தினார்களே....லாரி உரிமையாளர்கள் எல்லாம் ஆக்ரோஷமாக பேசுவதை கேட்டேன் (அதே கோஷம் தான்....தமில்டா...தமிலர்கள்டா...விவசாயிகள்டா). ஐயா... தெரியாமல்தான் கேட்கிறேன். விவசாயிகள் மீது அவ்வளவு அக்கறையிருந்தால் திருட்டுமணலை எங்கள் லாரியில் அள்ளிக்கொண்டுபோக மாட்டோம் என்று முடிவுக்கு வருவதற்கென்ன ? ரயிலை மறிக்கும் ஆசாமிகள் எல்லாம் - காவேரி பேஸினில் நடைபெறும் அராஜகங்களை கண்டித்து - ஒருநாள் முழுக்க தமிழ்நாடு முழுக்க கடையடைப்பு/போராட்டம் நடத்தினால் என்ன ? We have fucked up the whole system. Period. அதை சரி செய்யாமல், இந்தாண்டு தண்ணீர் கிடைக்கலாம்... அடுத்தாண்டு கிடைக்கலாம்..அதற்கடுத்து ? மீண்டும் மீண்டும் மீண்டும் மீண்டும் மீண்டும் மீண்டும் மீண்டும் மீண்டும் மீண்டும் மீண்டும் மீண்டும் மீண்டும் பலரும் எதிர்பார்ப்பது ஒரே விஷயம் தான். நமக்கு இன/மொழி பற்றாளர்களைவிட visionaries தான் தேவை. துரதிர்ஷ்டவசமாக நம்மிடம் அப்படி யாருமே இல்லை. 50 வருடங்கள் கழித்து தமிழ்நாட்டின் இயற்கை வளம் எப்படி இருக்கும் ? இந்த கேள்விக்கு இப்போதிருக்கும் அரசியல்வாதிகளுள் எத்தனைபேர் - முதலில் இந்த விஷயத்தின் முக்கியத்துவத்தை உணர்ந்திருக்க வேண்டுமே..அதுவே கஷ்டம் - தெளிவான பதில் வைத்திருப்பார்கள் என்று நினைக்கிறீர்கள் ? அரசியல்வாதிகளை விடுங்கள். நாம் என்ன தெரிந்து வைத்திருக்கிறோம் ? நமது தற்போதைய நிலைமை என்ன ? ஒருவேளை கடுமையான வறட்சி ஏற்படுகிறது...என்ன செய்வோம் ?. 1 லிட்டர் - 20 ரூபாய். 50 ரூபாயாகுகிறது - என்னால் வாங்க முடியும். 100 ரூபாய் - சமாளிக்க முடியும். ஆனால் அடிமட்டத்தில் இருக்குமாளுக்கு ? அடுத்த சந்ததியினருக்கு (இதற்குத்தானே ஐயா காதல் - கல்யாணம் - குழந்தை குட்டி - lifeல செட்டிலாகனும் - எல்லாம். அதற்கே ஆபத்தென்றால் ) என்ன பதில் வைத்திருக்கிறோம் ? 1) சென்னைவாசிகளே, மற்ற இடங்களை விடுங்கள். உங்கள் ஏரியாவில் டிசம்பர் 2015ல் வெள்ளம் வந்திருந்தால் - பருவமழை ஆரம்பிக்க இன்னும் மூன்று மாதங்களே உள்ளன - அதை தடுக்க தற்போது என்ன மாதிரியான நடவடிக்கை எடுக்கப்பட்டுள்ளது... என்ன ஏது....எதாவது விசாரித்தீர்களா ? 3) உங்கள் வீட்டின் நிலத்தடிநீர் மட்டம் எத்தனை அடிகள் ? Over head tankல் boreலிருந்து தண்ணீர் நிரப்புவதில் முன்பிருந்ததைவிட - நேரத்தில் - வித்தியாசம் இருக்கிறதா ? 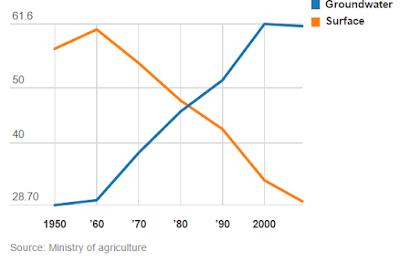 4) Cash cropsகள் என்னென்ன ? ஏன் அந்தப் பெயர் ? 5) Minimum Supportive Price(MSP) - அப்படியென்றால் ? பூமியின் மொத்த நீரில், 97.4% கடல் நீர். மீதி 2.6% மட்டுமே நன்னீர். Freshwater. 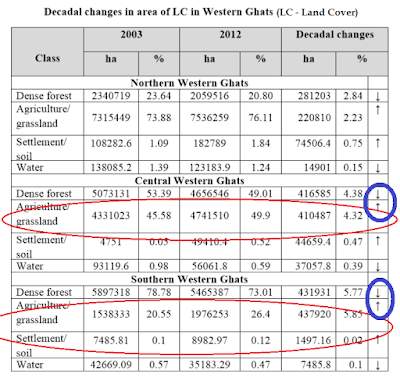 அந்த 2.6%டிலும் ஏறக்குறைய முக்கால்வாசி போலார் பகுதியில் இருக்கும் glaciers. எல்லாம் போக, ஆறுகளில் குளம் குட்டைகளில் இருக்கும் நீர் எவ்வளவு இருக்கும் ? இந்தப் படத்தில் இருக்கும் சின்ன bubble அளவிற்குத்தான். பெரிய bubble தான் அந்த 2.6%. ஏன் எப்பொழுதும் வானத்தில் மேகங்கள் இருக்கின்றன ? ஏன் எப்பொழுதும் கடலில் நீரின் அளவு ஒரு நிலையிலேயே இருக்கிறது ? எளிமையான காரணங்கள். இதுவொரு endless cycle. கடல் நீர் ஆவியாகி மேலே செல்கின்றன(Evaporation) -> ஆவி, கொஞ்சகொஞ்சமாக உறைந்து மேகமாகிறது(Condensation) --> வெப்ப சலனங்கள் காரணமாக மேகம் தேக்கி வைத்திருக்கும் நீர் உடைந்து மழையாகப் பொழிகிறது(Precipitation). கவனித்தீர்களா... best examples of the monsoon system on the planet. இதுவும் போதாதென்று மேற்குத்தொடர்ச்சி மலை நமக்குத்தரும் கொடைகளில் முக்கியமான மூன்று விஷயங்கள்: கோதாவரி, கிருஷ்ணா, காவேரி. இம்மூன்று நதிகளையும் தாண்டி, துங்கபத்ரா – தாமிரபரணி போன்ற ஆறுகளையும் அதன் கிளையாறுகளையும் கணக்கெடுத்தால் ஒரு பக்கத்திற்கு லிஸ்ட் போடலாம். பல்லுயிர் ஓம்புதல் – இயற்கை வழிபாடு – இயற்கையோடு இயைந்த வாழ்வு கொண்ட தமிழர்/இந்தியர் மரபு என்றெல்லாம் காலங்காலமாக ஜல்லியடித்துக்கொண்டுவரும் நாம் என்ன செய்திருக்கிறோம் ? 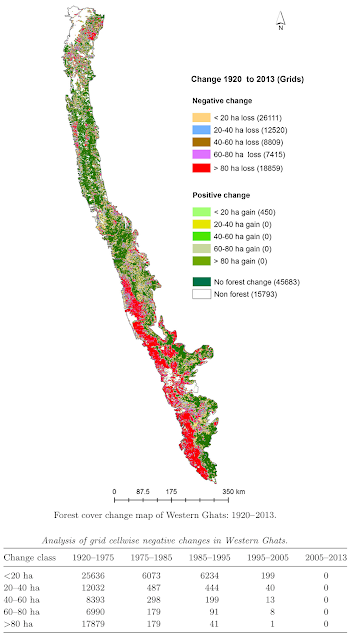 // Change analysis has revealed the net loss of 35.3% of forest area in the Western Ghats from 1920’s to 2013 //. எண்பதே வருடத்தில் 35.3 % அழிந்தேவிட்டது. இத்தனைக்கும் இது அரசு துறை சார்ந்த அமைப்பு வெளியிட்ட ஸ்டடி. இழப்பு மேலும் அதிகம் என்று வேறு சில ஆராய்ச்சிகள் கூறுகின்றன. இந்த அழிவிற்கும் மழைக்கும் என்ன சம்பந்தம் ? ஏகத்துக்கும் இருக்கிறது. 1920ல் ஒரு லட்சம் ஹெக்டரில் மரங்கள் இருந்தன என்று வைத்துக்கொள்வோம். அத்தனை மரங்கள் சேர்ந்து செய்யும் evapotranspiration + வெப்பநிலை/காற்று சலனங்களினால் கோவாவில் ஆரம்பித்து தமிழ்நாடு வரை மழை அளவு ஒருமாதிரி இருந்திருக்கும் அல்லவா. இப்பொழுது, ஒரு லட்சம் ஹெக்டர் 64,000மாக குறைந்திருக்கிறது. இது என்ன மாதிரியான விளைவுகளை ஏற்படுத்தும் ? சீரான மழை இருக்காது, ஒரு மாதத்தில் பெய்ய வேண்டிய மழை ஒன்றிரண்டு நாட்களில் பெய்து முடித்துவிடும்; இல்லை பொய்த்துப்போக நேரிடும். நான் சொல்லவில்லை. IISc இந்த விரிவான ஸ்டடி சொல்கிறது. அடுத்த பத்தாண்டுகளில் மேற்குத்தொடர்ச்சி மலை சார்ந்த மழை அளவு குறைவாகவே இருக்குமென்று. கர்னாடகா தான் இதில் மிகவும் பாதிப்படையக்கூடுமென்றும் இந்த ஸ்டடி கூறுகிறது.இந்த அறிக்கையின் Appendixல் மிகத்தெளிவாக – அடுத்த பத்தாண்டுகளுக்கான மழை அளவு கணிப்பு பட்டியலிடப்பட்டிருக்கிறது. ஒருசில மாதங்கள் தவிர, பல மாதங்களில் மழை அளவு சீரற்றதாகவே உள்ளது. 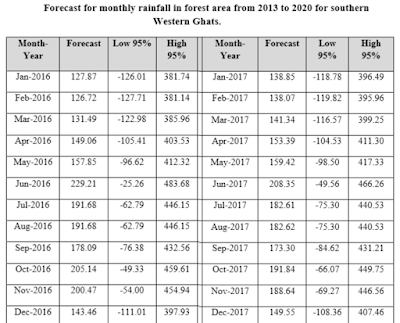 குவாரிகளில் ஆரம்பித்து விவசாயம் வரை deforestrationனுக்கான பல காரணிகளுண்டு. உதாரணத்திற்கு விவசாயம். மலைப்பகுதியை ஆக்ரமித்து (மண்வளம் காரணமாக) விவசாயம் செய்வது காலங்காலமாக நடந்து வருகிறது. விளைவு ? 2003 – 2012. பத்தே வருடம். எவ்வாறு விவசாயம் என்ற பெயரில் காடுகள் அழிக்கப்படுகின்றன என்று பாருங்கள். இருப்பதிலேயே Southern Western Ghatsல்(கர்னாடகா - தமிழ்நாடு - கேரளா) தான் பாதிப்பதிகம். மழை பெய்தது/பெய்கிறது/பெய்யப் போகிறது. அடுத்து ? இந்த கட்டம்தான் மிகமிக முக்கியமானது. எவ்வளவு கவனமாக நாம் செயல்பட வேண்டும், அசட்டையாக நாம் செய்யும் காரியங்களினால் எவ்வாறான விளைவுகள் ஏற்படும்....ஏகப்பட்ட விஷயங்களை புரிந்துக்கொள்ள Groundwater/Surface water பற்றிய புரிதல் மிகமிக தேவையானது. Surface water: குளம், குட்டை, ஆறுகள், ஏரிகள் – இவைகள் அனைத்துமே surface water. நிலத்தின் மேற்பரப்பில் இருக்கும் நீர். மழை பெய்தவுடன், மேடான பகுதியிலிருந்து இறக்கமான பகுதிக்கு நீர் ஓடும். நடுவில் பள்ளம் (குளம், குட்டை, ஏரி) இருந்தால் அங்கே தேங்கி நின்றுவிடும். Western ghatsசில் பெய்யும் மழையால், கிட்டத்தட்ட 2800m உயரம் என்பதால் மழைநீர் ஒன்று சேர்ந்து(காவேரி) பள்ளத்தை நோக்கி ஓடுகிறது. பள்ளம் ? கடல் தான். பல மில்லியன் வருடங்களாக இந்த process நடந்துகொண்டிருக்கிறது. இந்த natural flow தடைப்பட்டால் – ஆற்றுப் பாதையில் ஆக்கிரமிப்பு மாதிரி – என்னாகும். Simple. சென்னை டிசம்பர் 2015. 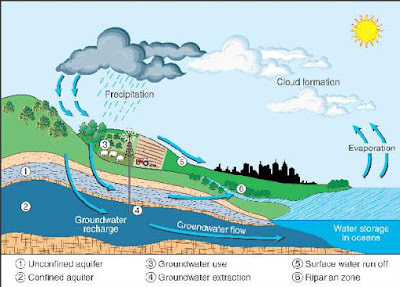 Groundwater: மழை அடித்துத் துவைத்திருக்கும். ஆனால் அடுத்தநாள், சுத்தமாக எல்லா நீரும் காணாமல் போயிருக்கும். அட பகல் நேரமாக இருந்தால்கூட ஆவியாகியிருக்கும் என்று புரிந்துகொள்ளலாம். இரவு நேரத்தில் எங்கே போயிருக்கும் ? Of course, எல்லாருக்கும் தெரிந்ததுதான். பூமி உறிஞ்சிக்கொள்ளும். பூமி என்ற வஸ்து என்று தோன்றியதோ, எப்பொழுதிருந்து மழை பெய்ய ஆரம்பித்ததோ எப்பொழுது நதிகள் ஆறுகள் ஓட ஆரம்பித்ததோ அன்றிலிருந்து பூமி நீரை உறிஞ்சிக்கொண்டே இருக்கிறது. அந்த நீர் எங்கே போகும் ? 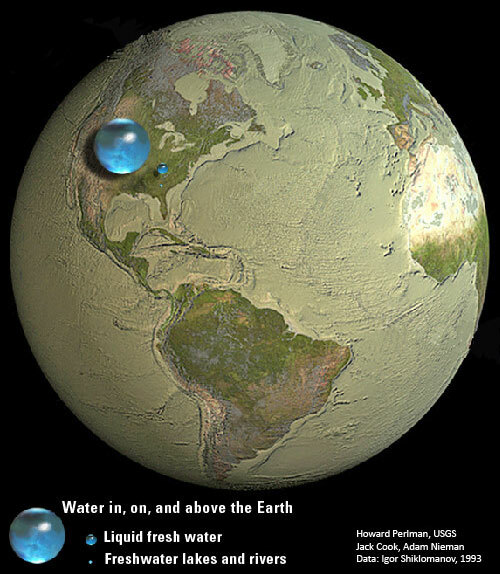 Aquifers. எளிமையாக சொல்வதென்றால், பூமிக்கு அடியிலிருக்கும் பாறை இடுக்குகள். நமது பூமிக்கடியில் எல்லா இடங்களிலும் நிலத்தடி நீருண்டு. அது எந்த மட்டத்தில், எந்த மாதிரியான பாறைகளுக்கு நடுவில் என்பதுதான் கேள்வி. க்ரைண்டர் துடைக்கும் ஸ்பான்ஜ் மாதிரியான அமைப்பை கற்பனை செய்துகொள்வோம். ஸ்பான்ஜின் மெட்டீரியல், கடிமானதாக/தண்ணீர் உறிஞ்சும் தன்மை குறைவாக இருந்தால்....நிச்சயமாக ஸ்பான்ஜ் தண்ணீரை பிடித்துவைக்கும் அளவு குறையும் தானே. அதுபோலவே...பாறை வகைகளைப் பொறுத்துதான் நிலத்தடி நீரின் ஓட்டம் இருக்கும். Limestone மாதிரியான வகை என்றால் நீரை அதிகளவு “பிடித்து” வைக்கும். இந்த பாறைகளிலிருக்கும் இடுக்குகள்/ஓட்டைகளின் அளவைத்தான் porosity என்பார்கள். இந்த நிலத்தடி நீர், gravityயின் காரணமாக கடல் மட்டத்தை நோக்கி நகர்ந்துகொண்டே இருக்கும். பாறைகளமைப்பு, மண் தன்மை போன்ற காரணிகளால் இந்த “நகர்தல்” சில சமயம் மிகமிகமிக மெதுவாக ஆண்டுக்கணக்காக நடைபெறும். சில சமயம் மிக வேகமாக ஒரேநாளில் கூட நகர்வதுண்டு. Riparian zone - இது மிக முக்கியமானது. ஆறு/நதி ஓரங்களில் இருக்கும் நில/காடு பரப்புகளுக்கு riparian zone/forests என்று பெயர். மிகவும் வளமையான பகுதிகள் இவை. ஏகப்பட்ட உயிரினங்கள் இந்த riparian zoneகளை நம்பியுள்ளன. Surface waterக்கும் Groundwaterக்கும் இருக்கும் பல முக்கிய வேறுபாடுகளில் ஒன்று – தூய்மைத்தன்மை. 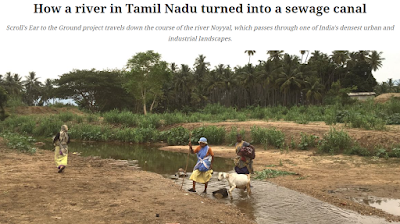 நிலத்தடி நீர் பூமிக்கடியில் இருப்பதால், surface waterல் இருக்கும் வைரஸ், பாக்டீரியா போன்றவைகளோ, கழிவுகளோ இருக்காது. அடியில் போகப்போக Filterராகிவிடும். 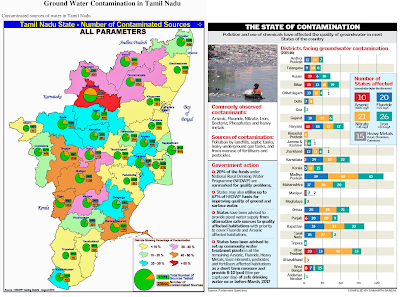 மாறாக, contamination இருக்கும். குறிப்பாக வேதிப்பொருட்கள். நிலத்தடிநீர் மெதுவாக நகர்வதால் – ரசாயன வேதி பொருட்கள் எல்லாம் உள்ளே இறங்கி இறங்கி தங்கி நச்சுத்தன்மை கூடும். Surface waterல் இருக்கும் கழிவுகளைக்கூட கொஞ்சம் சிரமப்பட்டு சரிசெய்து விடலாம். ஆனால் அந்த surface waterரை ஆண்டுக்கணக்கில் உறிஞ்சிகொண்டே இருக்கும் நிலத்தடி நீரில் படிந்த வேதிபபொருட்களை நீக்குவது முடியாத காரியம். இதனால்தான் பலரும் தோல் தொழிற்சாலை கழிவுகளிலிருந்து பிளாஸ்டிக் கழிவுகள் வரை ஆறுகளில் முறையில்லாமல் கலப்பதை கடுமையாக எதிர்க்கிறார்கள். தமிழ்நாட்டின் தற்போதைய நிலை என்ன ? Tamilnadu Pollution Contraol Boardன் ரிபோர்டை படித்தால் உண்மையான நிலவரம் புரியும். Over exploitation எப்படி நடக்கிறது ? ஆக்டோபஸின் டென்டகில்ஸ் மாதிரி ஏகப்பட்ட கிளைக்கதைகள் இதற்குண்டு. மேலிருக்கும் படம் மிகத்துல்லியமாக நிலைமையை விளக்குகிறது. போர் போடும்போது - அந்த இடத்தின் சூழலியல், மண்ணமைப்பு, நீர்வளம் பற்றியெல்லாம் கவலையேபடமால் ஆழமாக செல்லச்செல்ல சுற்றி இருக்கும் எல்லா நீரும் போர்வெல்லை நோக்கியே வரும்தானே. இதனால் என்ன நடக்கும் ? இதுவே கடற்கரையோரம் போர்போட்டால் ? இயற்கையாக கடலைநோக்கி நகர்ந்துகொண்டிருக்கும் நீர் உள்வாங்கும். அந்த நீர் முடிந்தவுடன்....கடல்நீர் உள்ளே வர ஆரம்பிக்கும். இப்படித்தான் சில விவசாய நிலங்களில் உப்புநீர் உள்ளே ஏறுவது. விவசாயத்திற்கு நிலத்தடி நீரை உபயோகப்படுத்துவதை எப்படி குறை சொல்ல முடியும் ? சுத்த பேத்தல் இது. அதானே.....நிற்க: இந்தியாவைப் பொறுத்தவரை 1960கள் மிகமிக முக்கியமான ஆண்டுகள். உணவில் தன்னிறைவை அடைந்தே தீருவது என்ற முனைப்புடன்....இந்தியா இறக்குமதி செய்த "பசுமை புரட்சி" கோடிகணக்கான இந்தியர்களின், குறிப்பாக விவசாயிகளின் தலையெழுத்தை அடியோடு மாற்றியது. அதோடு மட்டுமா...நாட்டின் விவசாய நிலங்களின் போக்கையும் அடியோடு மாற்றித்தொலைத்தது. அதுவரை surface waterகளான ஆற்றுநீர், குளம், குட்டைகளை நம்பி இருந்த விவசாயம், கொஞ்சகொஞ்சமாக நிலத்தடி நீரை நோக்கை நகர ஆரம்பித்தது. காரணம் ? 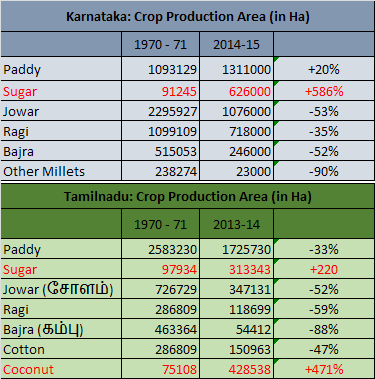 "இறக்குமதி" செய்யப்பட்ட HYV (High Yield Varieties) அரிசி/கோதுமை விதைகளுக்கு நமது பாரம்பரிய விதைகளை விட பலமடங்கு தண்ணீர் தேவைப்பட்டது. 1950களில் இந்தியா முழுக்க - நிலத்தடி நீரை நம்பி செய்யப்பட்ட விவசாயத்தின் சதவீதம் இன்று எந்தளவுக்கு இருக்குமென்று நினைக்கிறீர்கள் ? 10.....20....50...100...ம்ஹும்....500 %, சரியாகத்தான் வாசித்தீர்கள் 500 % அதிகரித்திருக்கிறது. குறைந்தசெலவில் மின் மோட்டர்கள், இலவச மின்சாரம் என்று பலதும் சேர்ந்து சக்கையாக நிலத்தடி நீர் உறிஞ்சப்பட்டது. இந்த HYVகளால் ஏற்பட்ட இன்னொரு கொடுமை, விவசாய நிலங்களின் தன்மை மாறியது. இதோடு பல காரணிகளின் சேர, விவாசாயிகள் பணப்பயிர்களுக்கும், கரும்பிற்கும் மாறும் சூழ்நிலைக்கு தள்ளப்பட்டனர் (இதைப்பற்றி கொஞ்சநேரங்கழித்து பேசுவோம்). விவசாயத்தை மட்டும் குறை சொன்னால் எப்படி....மற்ற துறைகள் என்ன செய்தது ? நியாயமான கேள்வி. ஆனால், தமிழ்நாட்டின் மொத்த நீரளவில் கிட்டத்தட்ட 90% விவசாயத்திற்குதான் தேவைப்படுகிறது. OK. காவேரி பிரச்சனைக்கு வருவோம். தமிழர்கள் வஞ்சிப்பு, நூற்றாண்டுகால ஒப்பந்தம்...blah...blah..blah...இதெல்லாம் தாண்டி, அசலான பிரச்சனைகளாக மூன்று விஷயங்களைச் சொல்லலாம். 1) 2015ல் விவசாயிகள் தற்கொலை அதிகளவில் நடந்த மாநிலங்கள் என்னென்ன தெரியுமா ? நமக்கு மேலே இருக்கும் எல்லா தென்னக மாநிலங்களும். 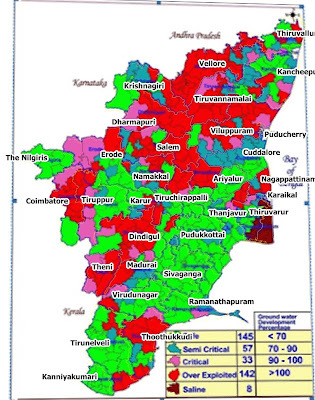 குறிப்பாக, கர்நாடகாவில் பாருங்க...40% அதிகரித்திருக்கிறது. தென் கர்நாடகா - படுவறட்சியில் உள்ளது. அதுபோலவே, ஆந்திரா - தெலுங்கானாவின் பல பகுதிகளும். இந்நிலையில் சிறிய check-damsகளை கட்டுவதை நாம் எவ்வாறு நிறுத்த சொல்ல முடியும் ? அப்பறம் தண்ணீர் இல்லாமல் நாம் மட்டும் சாவதா...அதானே. பொறுங்கள். கர்னாடகாவில் எங்கிருந்து பிரச்சனை தொடங்கியதென்றால், அவர்களது பயிர் செய்யும் முறையிலிருந்து. நாம் மட்டும் விதிவிலக்கல்ல. ஆனால், கர்னாடகம் நம்மைவிட, அதிகளவில் நீர் தேவைப்படும் பயிரை பயிரிட்டுக்கொண்டிருக்கிறது. அதுபற்றிய மிகத்தெளிவான கட்டுரை இது. இந்தக் கட்டுரை தான் என்னையும் இவ்வளவு நீண்ட கட்டுரையை எழுதத் தூண்டியது. கர்னாடகாவில், 40 வருடத்தில் கருப்பு பயிரிடப்படும் ஹெக்டரின் அளவு....நம்ப முடிகிறதா...+586 % அதிகரித்திருக்கிறது. இதுபோக, நெல் (Paddy) சாகுபடி. நெல் - அதிகம் தண்ணீர் தேவைப்படும் பயிர். அதன் பரப்பளவும் கர்னாடகாவில் அதிகரித்திருக்கிறது. இதுபோக, பணப்பயிர்கள். அரசாங்கத்தின் கேணத்தனமான பல கொள்கைகளையும் காரணமாக சொல்ல வேண்டும். உதாரணத்திற்கு, கரும்பிற்கு தரப்பட்டும் குறைந்தபட்ச ஆதார விலை (MSP - Minimum Support Price) அதிகம். அதனால், ஏற்கனவே நட்டத்தில் பொழப்பை நடத்திக்கொண்டிருக்கும் விவசாயிகள் அதைநோக்கி நகர்வதைத் தவிர வேற வழியில்லையே. நமது பாரம்பரிய உணவுப் பயிர்களான - தண்ணீர் மிகக்குறைவாகத் தேவைப்படும் - சிறு தானியங்களை யார் கண்டுகொள்கிறார்கள் ?. தமிழ்நாடென்று மொத்தமாக எடுத்துக்கொண்டால், கரும்பு பயிரிடப்படும் பரப்பளவு +220% கூடியிருக்கிறது. நெல், பருத்தி போன்ற தண்ணீர் அதிகளவு தேவைப்படும் பயிர்களின் பரப்பளவு குறைந்திருக்கிறது.ஆனால் பணப் பயிர்களின் பரப்பளவு அதிகமாயிருக்கிறது. நமது மண்வளம்/நீர் வளத்திற்கு உகந்த சிறுதானியங்களின் பரப்பளவும் குறைந்திருக்கிறது. மேலதிக விவரங்களை ரிப்போர்ட்டிலிருந்து பெறலாம். மேலிருக்கும் புள்ளிவிவரம் தமிழ்நாடு முழுமைக்குமானது. சிக்கல் எங்கேயென்றால் காவிரி டெல்டா பகுதிகளில் தான். இந்த இரண்டு மேப்களைப் பாருங்கள். பிரச்சனையின் ஆரம்பப்புள்ளி இதுதான். காவேரி பேஸின் பகுதியில் கர்னாடகா, தமிழ்நாடு - இரண்டு மாநிலங்களுமே அதிகளவில் கருப்பையும், நெல்லையும் பயிரிட்டுள்ளனர். (தற்போது நீர் திறக்கப்படுவது சம்பா சாகுபடிக்குத்தான் என்றாலும்) இரண்டிற்குமே அதிகளவில் தண்ணீர் தேவை. நிலத்தடி நீர்தான் பெருமளவில் பயன்படுத்தப்படுகிறது. இதுவே over exploitationனிற்கு வழிவகுக்குகிறது. அதைத்தான் மேலே இருக்கும் தமிழ்நாடு மேப்பில் தெளிவாக பார்த்தோமே. இந்த over exploitation, ஆறு/குளம்/குட்டை/ரிசர்வாயர்களில் இருக்கும் surface waterரை பாதிக்கிறது. இந்த சைக்கிள் அப்படியே தொடர்ந்துகொண்டே இருக்கும். நிலத்தடி நீரை விடுங்கள். இவ்வளவு நீர்பற்றாகுறை நிறைந்த மாநிலம். தண்ணீருக்காக சுற்றியிருக்கும் எல்லா மாநிலத்துடனும் சண்டை. நிலமை இப்படியிருக்கையில், உள்ள நீரை எவ்வளவு ஜாக்கிரதையாக பாதுகாக்க வேண்டும் ? ஆனால் தமிழ்நாட்டில் (கர்நாடகாவிலும் தான். கேனத்தனத்தில் மட்டும் அணைத்து இந்தியர்களும் ஒன்று) மணல் மாஃபியா கொடிகட்டிப் பறக்கிறது. ஆற்று மணலை எடுத்துக்கொள்வோமே. ஆற்று மணல்கள் ஏன் முக்கியத்துவம் வாய்ந்தது ? ஆற்று மணல்களுக்கு நீரை உறிஞ்சும் தன்மை அதிகம்; மழை நீரை உள்ளது உள்ளபடி அலேக்காக உறிஞ்சிக்கொள்ளும். இதனை கண்டபடி அள்ளும்போது நிலத்தடி நீர் மட்டம் குறையும்; ஆற்றின் போக்கு மாறும்; வெள்ளப்பெருக்குகளுக்குக்கூட காரணமாக அமையும். இதை தற்போது அரசாங்கமே நடத்தித்தொலைவதால் இன்னும் வசதியாக போயிற்று. ஐந்தடி வரை அள்ளலாம் என்று அனுமதி வாங்கிக்கொண்டு 25 அடிவரை அள்ளப்பட்ட இடங்கலெல்லாம் தமிழ்நாட்டில் உண்டு. இந்த ஆய்வைப் படித்துப்பாருங்கள். தாமிரபரணியில் எப்படி அழித்தொழிக்கப்பட்டிருக்கிறதென்று. இதுபோக, தமிழ்நாட்டின் மொத்த மணல்தேவையில் 60% காவிரியில் பேஸின் பகுதியிலிருந்துதான் எடுக்கப்படுகிறது (அரசே அனுமதித்த அளவின்படி). இதோடு திருட்டுத்தனமாக மணல் அள்ளுதலையும் சேர்த்துக்கொள்ளுங்கள். சுத்தம். டிட்டோ, கர்னாடகாவிலும் இதேதான் நடக்கிறது. God's own country...கேரளா மட்டும் தப்புமா என்ன ? Western Ghats முழுக்க இதே நிலைமைதான். ஆட்சி மாறினாலும் இந்த கொள்ளைகள் மட்டும் என்றாவது குறைந்து பார்த்திருக்கிறீர்களா ? திமுக - அதிமுக ஆட்சி மாறினாலும், மாண்புமிகு புரட்சித்தலைவி அம்மா அவர்கள் - திமுக ஆட்சியில் கட்டபட்டது என்ற ஒரே காரணத்திற்காக கோட்டூர்புரம் லைப்ரரியை மூடினார்களல்லவா..ஆனால், க்ரானைட்/கணிம வளம்/மணல் அள்ளுதல் - இந்த விஷயங்களிலெல்லாம் முந்தைய திமுக ஆட்சியின் கொள்கைகளை மட்டும் அப்படியே வைத்துக்கொண்டார். ஏனென்று நான் சொல்லித்தெரியவேண்டியதில்லை. Desiltingகினால் (தூர் வாருதல்) என்ன நடக்கும் ? மழை பெய்கிறது. குளம், குட்டைகளில் தேங்குகிறது, ஆறுகளில் ஓடுகிறது. இந்த அமைப்புகளை முறையாக ஆழப்படுத்தி – குப்பைகள் சேராமல் வைத்திருந்தால்....நிலத்தடியின் நீர்மட்டும் அதிகரிக்கும்; இதன்மூலம் – வேதிப்பொருட்கள் கலந்த நீரின் மாசு குறையக்கூடும்; தண்ணீர் நிறைய தேங்கி இருப்பதன் காரணமாக தண்ணீர் தட்டுபாடான காலத்தில் ஓரளவு சமாளிக்க முடியும். க்வாரிகளுக்கு வருவோம். க்வாரிகளால் என்ன பாதிப்பு ஏற்படும் ? நிலத்தடி நீர் பாறைகளுக்கிடையே இருக்கும்; அது பாறையின் தன்மை பொறுத்து நீரோட்டம் இருக்குமென்று கொஞ்சநேரத்திற்கு முன்பு பார்த்தோமில்லையா ? Granite போன்ற பாறைகள் அடர்ந்த வகைப் பாறைகள். இதில் ஏற்கனவே குத்துயிரும் கொலையிருமாகவே நிலத்தடி நீர் நகர்ந்துகொண்டிருக்கும். நாம் அதையும் சிதைக்கும் போது – க்வாரிகள், வெடிகள் – மொத்தமாக இந்த பாறைகளின் அமைப்பு சிதைந்து நிலத்தடி நீர் அங்கேயே மாட்டிக்கொள்ளக்கூடும். இதுபோன்ற பகுதிகளை aquitards என்று சொல்வார்கள். இதைமட்டும் சொல்லியாக வேண்டியுள்ளது. மதுரையில் கிரானைட் முறைகேடு/சகாயம் விஷயம்...அனைவருக்கும் தெரிந்திருக்கும் என்று நம்புகிறேன். க்ரானைட் வெட்டி எடுக்கப்படுவதற்கு - 2003 to 2011 வரை 139 அனுமதிகள் வழங்கப்பட்டிருக்கின்றன. அதில், 77 அதிமுக (2001 - 2006 ஆட்சியில்) திமுக - 68 (2006 - 2011) ஆட்சியில். இதோடு முடித்துக்கொள்வோம். அடிக்கடி கேட்க நேரிடும், உடலெல்லாம் ப்ளேடால் கீறியதைப்போல என்னை பதற வைக்கும் சில வார்த்தைகள் "நதிநீர் இணைப்பு", "வீணாக கடலில் கலக்கும் ". மேலே பதிவு முழுக்க மனித ஜந்துகளுக்கு தேவையான விஷயங்களைப்பற்றி மட்டுமே பார்த்தோம். ஐயா.....ஆறு/நதி என்பது நமக்கானது மட்டுமல்ல. எல்லா உயிரினத்திற்கும் பொதுவானது. நம்மைவிட ஆயிரக்கணக்கான ஆண்டுகளுக்கு முன்பே இங்கே பலநூறு உயிரினங்கள் நடமாடிக்கொண்டிருந்தன. நாம் ஆற்றின் போக்கை மாற்றுகிறோம் என்று பேசுவதேகூட அபத்தத்திலும் அபத்தமானது. "மேற்குத்தொடர்ச்சி மலையில் தொடங்கி கேரளா வழியாக வீணாக கடலில் கலக்கும் ஆற்றை..." இப்படி பலரும் பேசத்'தொடங்குவதை பார்த்திருக்கிறேன். ஐயா...அந்த ஆறு போகும் வழியெல்லாம் நமக்கு தெரிந்த/நமக்கு தெரியாத எத்தனை எத்தனை உயிரினங்களை வாழவைத்துக்கொண்டிருக்கிறதென்று துல்லியமாக கணக்கிடும் அளவிற்கு மனிதனுக்கு சக்தியில்லை. ஆறும் - கடலும் சங்கமிக்கும் முகத்துவாரங்கள் குறிப்பிட்ட வகை மீன்கள், நண்டுகளில் ஆரம்பித்து பல உயிரினங்களுக்கு மிகமிக முக்கியமான பகுதி. இந்த சிறு உயிரினங்களை நம்பி பெரிய உயிரினங்கள் உண்டு. எல்லாவற்றையும்விட, சில processகள் irreversible. கிறுக்குத்தனமாக நாம் எதையாவது செய்துவைத்தோம் என்றால், மீண்டும் அதை சரிசெய்யவே முடியாது. மற்ற உயிரினங்களோடு சேர்த்து...சுத்திமுத்தி பாதிப்பு நமக்கும் வந்துசேரும். இந்த மாபெரும், அதியற்புதமான, intricate - சூழலியலில் நாமும் இருக்கிறோம். நாம் மட்டுமே கிடையாது. அவ்வளவே (இந்த புரிதலிருந்தால் ஏன் பெண்கள் மீதி ஆஸிட் அடிக்கப்போகிறான், சாதி கட்டமைப்பு இன்னும் இருக்கப்போகிறது). பூமிக்கு வந்தோமா - நமது சந்ததியை பெருக்கிவிட்டோமா - அனைத்தையும் மூடிக்கொண்டு, வேடிக்கை பார்த்தபடி இருந்தோமா - ஒருநாள் கட்டையை சாத்தினோமா....போதும். இதுவே போதும். எதையும் கெடுக்காமல் சும்மா இருப்பதே பெரிது. இதெல்லாவற்றையும் தாண்டி, இயற்கையின் complexityயை புரிந்துகொள்ள நமக்கு ஒரு ஆயுள் போதாது. ஆனால், புரிந்து கொள்ள முயற்சிக்கலாம். நமது குழந்தைகளுக்கும் புரிய வைக்க முயற்சி எடுக்கலாம். The relevant and valuable article contents were already posted in leading websites. They are posted and shared again with link back credit for the benefit of all audience. . Hope such re-posting practice creates a winning situation for the authors and their audience. Any objection on re-posting of the entire content in this blog, kindly instruct me for removal and the same will be removed forthwith.